Wearable sensors are devices that collect input information about the physical and biological properties of the body and environment. Further this information is utilized to do calculations which yields output information. Wearable sensors are implanted in wearable devices to track fitness, environmental and health activities such as heart rate, blood pressure, body temperature, stress level, movements, speed, local temperature etc. Wearable sensors are used in many devices such as fitness watch, smart shoes, glasses, VR headsets, jewelry (rings), hearable, sleep mask, body wear and others. The key factors driving the global wearable sensors market are compact size, low cost and miniaturization of sensors. Further, technological integration of wearable sensors with textiles is emerging trend in the market. Compact and advanced product development and merger and acquisition are the major strategies which the companies have adopted from the past 4-5 years. Innovation of specific sensors such as PIQ Multi –Sport wearable sensor is expected to boost the wearable sensor market in the upcoming years. The market of wearable sensors is anticipated to grow at considerable CAGR during the forecast period 2017-2024. The global wearable sensors market is expected to garner USD 1,943.68 million by 2024. Further, the market is expecting gigantic rise in the demand due to the miniaturization of sensors and advancement in healthcare industries. Further, the bolstering market of smartphones is going to augment the integrated wearable devices. Currently, North-America and Europe region are the largest market occupying more than 60% market share in the global market. North-America is the leader in the global wearable sensor market and it is anticipated to maintain the dominance during the forecast period. Being a developed region, they encourage and adopt the new innovations and technologies. Moreover, rising concern towards health and fitness is another factor which is driving the market in North-America. European market captures the second place in the global wearable sensor market. With ongoing technological advancements and rise in demand of body wearable devices, Europe is expected to witness a robust growth in the global sensors market over the next five to six years. Low cost of sensors, evolving advancement of technologies and rising consumer awareness towards health are few factors which are driving the growth of global wearable sensors market. In addition to that, growing smart clothes technology is anticipated to boost the demand for wearable sensors. 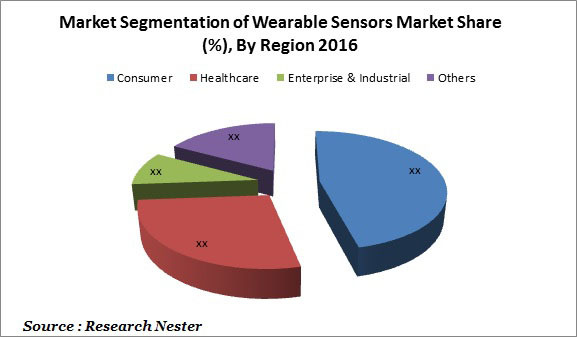 Moreover, rising healthcare sector and integration of new technologies like emergency cardiac arrest alarm and pre detection of diseases is expected to propagate the growth of wearable sensor market. However, high cost of advanced technological sensors is likely to hamper the growth of wearable sensors market globally. Likewise, less awareness among the population towards smart wearable and low availability of wearable products in the market are also some of the major factors which re restraining the growth of global wearable sensor market.